The Skinny: Wildly entertaining black comedy/triad picture that's both ambitious and effective. Simply one of the best movies of the year. 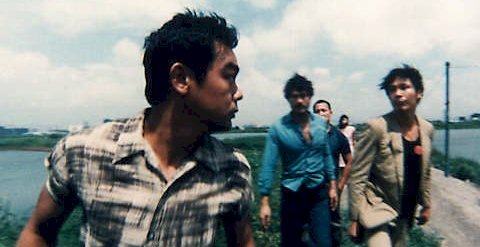 by Kozo: This arty triad flick from Wai Ka-Fai and Johnnie To is as good as genre pictures get in this era. Lau Ching-Wan is Kau, a small potato in the triad world who must make a fateful decision to discover who he is. With that decision, his life can diverge in two paths, each leading to an ultimate fate. Due to some narrative trickery, both options are explored in this film. The result is something truly interesting and entertaining. Kau’s experiences are triad parodies of the most blackly comic kind. The motley crew assembled to carry out the crimes consists of a bunch of inept losers, played with appropriate histrionic flair by Francis Ng, Cheung Tat-Ming, Tsui Kam-Kong, Cheng Cho, and Matthew Chow. This is a world where hired killers can’t drive and gaining “face” is an absurdist comedy.